This year is the first year that we're going to throw a Halloween party for the kids and I'm super excited! 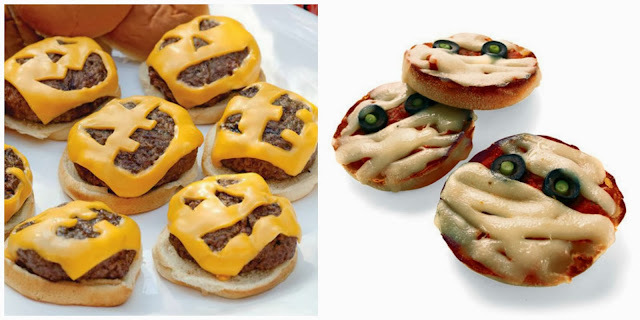 I've been searching on the internet for lots of Halloween party food ideas and I thought I'd show you some of my favourites. 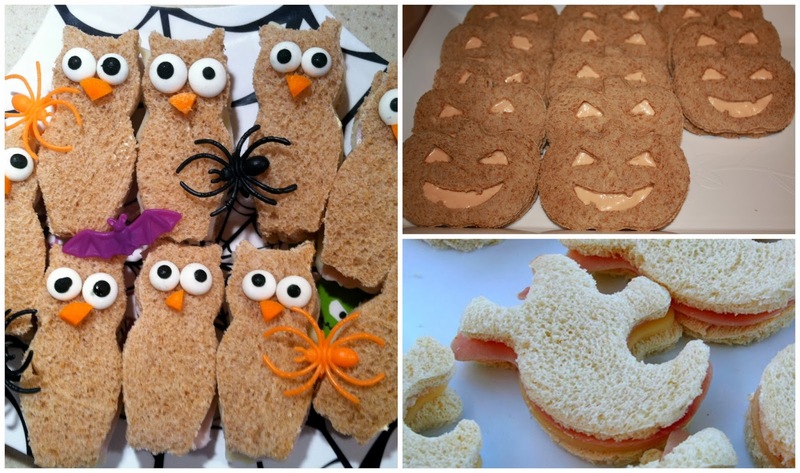 Making spooky sandwiches is really easy and super quick, all you need are some Halloween cookie cutters and you can turn any sandwich into a Halloween sandwich. I love this idea for burgers, just cut out pumpkin faces in your cheese slices and pop them onto your burgers. For the mummy pizzas you just use english muffins cut in half, spread some tomato puree on top and then lay strips of cheese across them leaving a gap for the eyes which are olives, really easy and really effective I think. 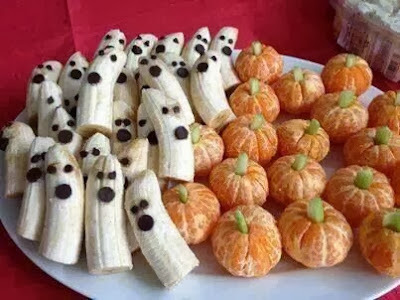 If it's healthy snacks you're looking for then these two ideas are perfect, make bananas look like ghosts by peeling them, cutting them in half and using writing icing to draw on the eyes and mouth. The little pumpkins are actually peeled satsumas with little slices of celery in the top as the stalks. 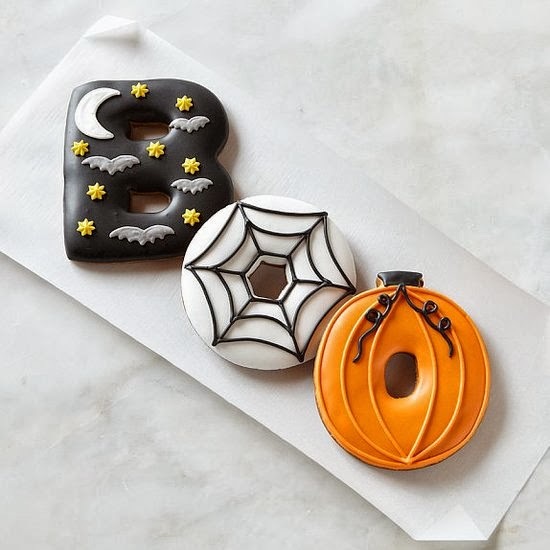 There are endless possibilities when it comes to Halloween biscuits, you can buy cookie cutters in all shapes and sizes and then use icing to decorate them however you like. My top tip for getting super neat icing is to pipe the outline first and allow it to set really hard and then just fill in the middle and you get a really neat finish to your iced biscuit. Something a bit different for Halloween is drawing spooky designs on pancakes using melted chocolate, I'm a big fan of pancakes and if I don't have time to make them from scratch I love to use the Abra-ca-Deborah ready made sweet dutch pancakes, you just pop them in the microwave for about 30 seconds and they're absolutely delicious. You can find them in the fridges at Tesco, Morrisons and Waitrose and they cost around £1.75 for 6. 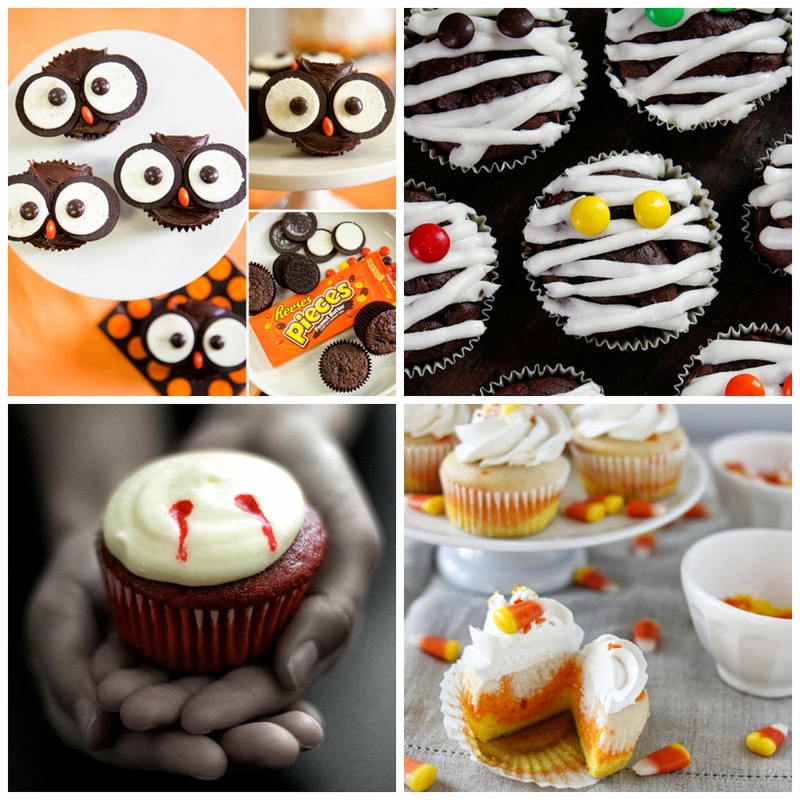 Lastly no party is complete without cupcakes and I've got some fab Halloween ones to show you. The first ones are the adorable owls which are made by taking a chocolate cupcake with chocolate frosting on, splitting some Oreo cookies and using only the sides that the filling sticks to to make the eyes and then popping on some brown M&Ms to finish the eyes and an orange M&M for the beak, I'm definitely going to make these for our party. The mummy cupcakes are made by again taking a chocolate cupcake and using white icing to make the stripes across and then you can use M&Ms or Smarties for the eyes. The vampire bite cupcakes are something I made last year and they were delicious, I made red velvet cupcakes and topped them with cream cheese frosting, I then used a skewer or something similar to make the bite marks and lastly I heated some jam to make it more runny and filled the holes and made it look like it was running down the cake like blood. Lastly you can just make some vanilla cupcake batter then separate it into three and use food colouring to colour one portion yellow, one portion orange and leave the last portion plain and then layer the batter in the cupcake cases and bake to make candy corn cupcakes. I hope these ideas were helpful and if you use any of them make sure you take pics and show me! The Abra-ca-Deborah pancakes were sent to me for review. Such cute ideas!!! The pancakes are deeeelish! 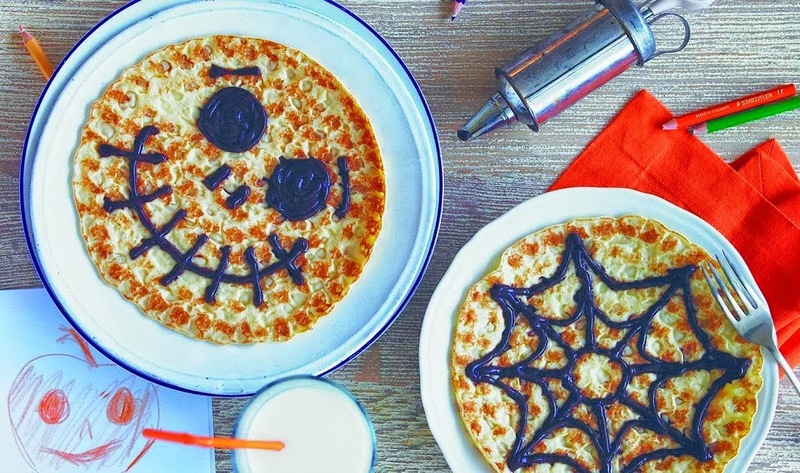 Nice blog, thanks for sharing your Halloween food ideas for party. I love the cookies, and everything on your blog.